The Online Learning Consortium and the Online Learning Journal invite you to submit a proposal for OLC Accelerate 2018: Accelerating Online Learning Worldwide. Submissions are now closed. Notifications will be emailed on August 3, 2018. 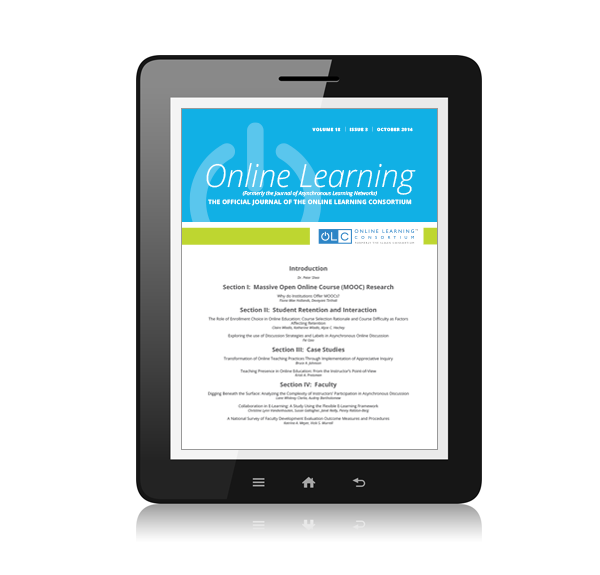 The Online Learning Journal (OLJ) in partnership with the Online Learning Consortium invites submissions for the graduate student sessions at OLC Accelerate 2018. The conference will convene November 14-16, 2018 at the Walt Disney World Swan and Dolphin Resort in Orlando, FL. We will be selecting proposals for Discovery Session presentations, or electronic poster sessions. We seek proposals that reflect and showcase our vibrant community of practice — promoting theory, research and methodology in online, blended, and web-enhanced teaching and learning. Note that each individual is limited to no more than one proposal submission. Proposals can include works in progress, research ideas, collaboration opportunities, or pilot projects. Discovery Sessions provide an excellent opportunity to present your ideas to your peers in a community forum. Those presenting as a graduate student through this CFP process will receive a discounted registration rate of $195, as well as a ticket to the awards luncheon. Please note that each presenter must bring their own laptop. We seek submissions by students currently enrolled in or recently graduated (within one year) from a Graduate (Master or Doctoral) program whose research is relevant to online, blended, and web-enhanced teaching and learning. To be considered for the review process, students must indicate an academic sponsor from their program (research/thesis advisor preferred), including full contact information for both the student and the sponsor/advisor. (It is often the case that the student and advisor submit as co-authors.) In addition, the proposal submission must follow the criteria of the OLC Accelerate 2018 conference sessions. Student authors are urged to coordinate with their advisor that the content for the proposal reflects the accuracy of the research study, as well as to ensure the proposal follows the submission guidelines. The following questions will guide evaluators in the refereed proposal review process. Do the title and abstract clearly describe the presentation? Stay up to date on OLJ publications. Sign up for email notifications.